Public FSE meeting about the petition and the next steps in European politics! Held on Saturday 30th of October 2010 at 9.30am in Casola Valsegno, Ravenna, Italy. Janez Potočnik, European Commissioner for the Environment is impressed by the unified energy the European cavers and NGO's put into this. Being a Slowenian citizen, he has a profound expertise about the problems with karst and karst water. He assured us that the countries who were not able to sign the petition within the short deadline can still do this. Ladislav Miko, Director for Nature in the Directorate General for Environment of the European Commission was handed over the declaration and we will stay in touch with him. Palo Forti, Full Professor of Geomorphology at University of Bologna, Director of the Italian Institute of Speleology and Past President of the International Union of Speleology wrote an official letter to support the petition (see downloads). Dr. Jean Clottes Foix, President of the International Federation of Rock Art Organizations (IFRAO) wrote an official letter to support the petition (see downloads). Every European speleological federation is kindly asked to sign the petition for protection of cave contents and send a copy to until the end of September. Many thanks to the people who helped with comments and improvement suggestions: Paolo Forti, Italy; Ioana Meleg, Romania; Jean Pierre Bartholeyns, Belgium; Jay Anderson, Australia; Helmut Steiner, Michael Laumanns, Friedhart Knolle, Stephan Kempe, Germany; Silvia Gautier, Netherlands; Christoph Spötl, Austria; Didier Caihol, France; Silvia Schmassmann, Switzerland; etc. have papers about problems, such as construction projects in cave and karst areas, karstwater, biodiversity etc. The signatures for written declaration Nr.66 were not enough to let it pass. We got 140 signatures so it lapsed, because 393 would have been the minimum for a success. many speleo clubs, speleologists and federations took part in this campaign -Thanks a lot! the information stand in the parliament was great success too, many interrested people who wanted to know more about the underground. These can be used for future projects. Already 112 deputies have signed the WD66 declaration! We want to thank all these deputies and all the people and organisation supporting us! For financial support of the flyers. For printing postcards and posters. For donation of 10 books "Inside Mother Earth" from Max Wisshak and the support of our information stand in Brussels. For the cave music in our presentation. For the donation of 'cavespagetti' as a culinary contribution and campaign support. Postcards of the campain are now available! Let us know how many you need (up to 10 per subject for speleo-clubs or 50 per subject for federations) by sending an email to . 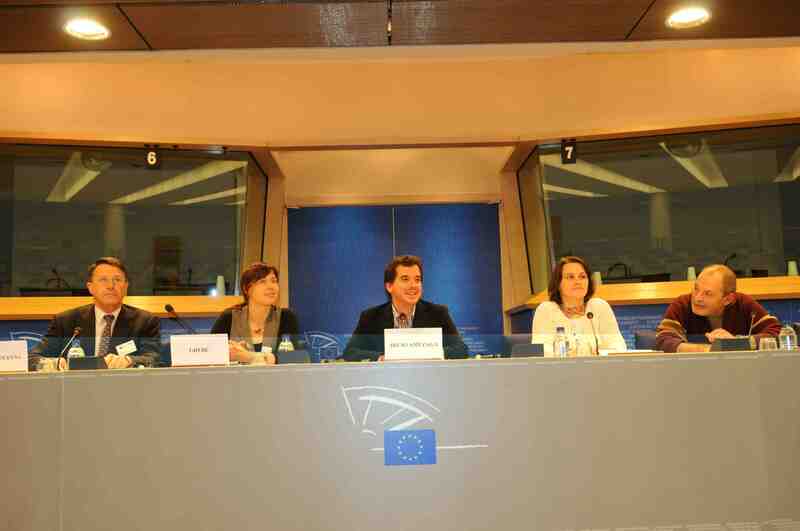 See photos of the speleo event in the parliament: http://picasaweb.google.com/christianegrebe. In two days 2000 postcards with the declaration text, 1000 flyers and 1000 packs of maccaroni were distributed! Many thanks to Prof. Paolo Forti and Ferdinando Didonna (Italy), Herman de Swart and Wietske van der Berge (Netherlands), Pierrot Clemens, Dirk van Daerme and Jean-Pierre Bartholeyns (Belgium), Kasia Biernacka (Poland), Rainer Fohlert, Bärbel Vogel and Christiane Grebe (Germany), Ioana Meleg and Viorel Lascu (Romania), Alexey Zhalov (Bularia), for their help at the information stand, the meeting with the European Commission, for visiting the deputies, pack 1000 packs of maccaroni and for their good vibrations at the European Parliament! Our press conference held today at the European Parliament was a great success and our stand was visited by a huge number of interested deputees, officials, journalists and other interested people. What has been done so far for WD 66! European Speleologists are working hand in hand for cave protection in Europe. AT: Is contacting their EU deputies at the moment. BE: Contacted their EU deputies already. Will provide information material and personal help. BG: Contacted their EU deputies already. Will provide information material and personal help. DE: Is contacting their EU deputies at the moment and will provide information material and personal help. German Cave Museum Iserlohn and Show Cave Dechenhoehle will lend a stalagmite with datings for the stand. GR: Contacted their EU deputies already. Will provide information material. IT: Is contacting their EU deputies at the moment. Will provide information material and movies. LU: Is contacting their EU deputies at the moment. PL: Is contacting their EU deputies at the moment. Will provide personal help for the campaign. PT: Is contacting their EU deputies at the moment. RO: Contacted their EU deputies already. Will provide information material and personal help. SI: Contacted their EU deputies already. This is our team for Brussels! We need 6-8 speleologists from 10th to 13th November to help at the stand and a professional photographer to take pictures at the stand, at the conferences, etc. If you are interested please contact . Concerning information material from spleological federations to hand out at the stand, please contact . Untill 20th of October 53 deputies already signed the declaration. → Question of Mikel Irujo MEP about the trade of speleothemes. The translation office has corrected the texts for WD 66 today. In every language the missing word" speleologists" was filled in. Due to a translation mistake in the parliamentary translation office, the word "speleologist" is the missing in paragraph 2 (c) in the current version, which you can download from the parliament. The translation office will change this as soon as possible. Please excuse this. On 11th November 2008 we are organising a press conference in the EU parliament. More information soon here ! 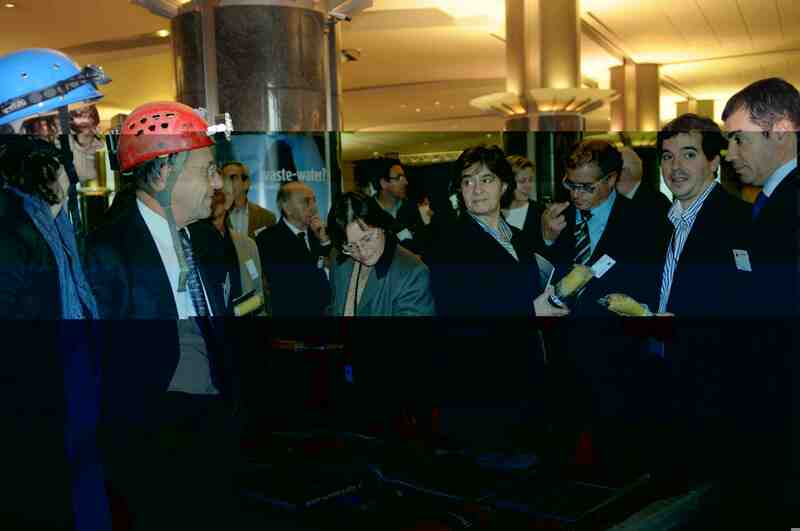 On 11th and 12th November 2008 our information stand is located in front of the plenar hall in the EU parliament !